Better late than never this week! It’s been a tad crazy lately, so I’m sorry this post didn’t make it up on Tuesday. 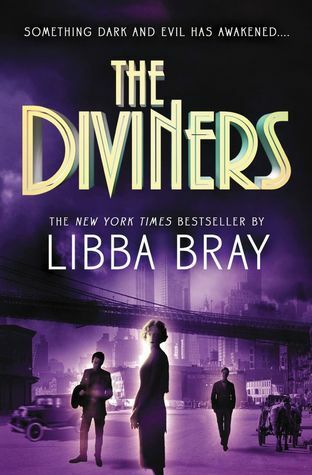 But The Diviners it the perfect book to start off this creepy Halloween weekend! Evie is destined to be a star, but is unfortunately stuck in small town Ohio. Until a small stunt leaves her in trouble and on the first train to her uncle’s in New York City. It’s not long before she is next deep investigating a series of murders that shock the city. But there is more to this murder, and Evie, and the young heroine must embrace her paranormal side to save the day. I enjoyed The Diviners! Evie is a relatable character with just enough moxy to make up for her flaws. The diverse cast of characters keep the plot moving at a fast pace and Bray expertly weaves these storylines together. I love how Bray makes you feel like you are standing in New York in the 1920s watching these events. The language, the clothing, the atmosphere; you get it all and it flows together seamlessly. The mystery was twisted and interesting and I was excited to see how the sacrificial stages would play out. The book is an enjoyable paranormal historical mystery and perfect for a lazy Halloween weekend. Surprisingly, the language is very telling and there are parts where the prose is essentially ‘and this happened.’ It didn’t make me dislike The Diviners, but I felt more showing language would have intensified the 1920s feel. It is also why the mystery just wasn’t scary for me on the same level that many others have mentioned. Otherwise, it was pretty good! The end left me curious and needing to know more. So, I will definitely be picking up Lair of Dreams, the next book in the series. What spooky reads are you enjoying this weekend?